I would like some info as well. I have a chance to pick up a Lofton with the purple name on the front and back but no 1/1 stamp. Whats the value of these cards and are the legit? I was offered the Cruz Row 0 one through Blowout. Not sure what to think of them or what to even offer on one. There's a seller on ebay with tons of Bankruptcy Fleer parallels, mostly 2002-2005. I bought a few that were supposed to be 1/1s, paid anywhere from $1 to $1.50. No one knows how many of any of these were printed, even the cards that were supposed to be 1/1s (this seller had as many as 10 copies of the "1/1"s). I buy any Bankruptcy Fleer product I can find but I wouldn't pay much for them. The Purple text is for the Masterpiece 1/1's, but the ones I have pulled, all had 1/1's or they spelled out "One of One" on the front.. 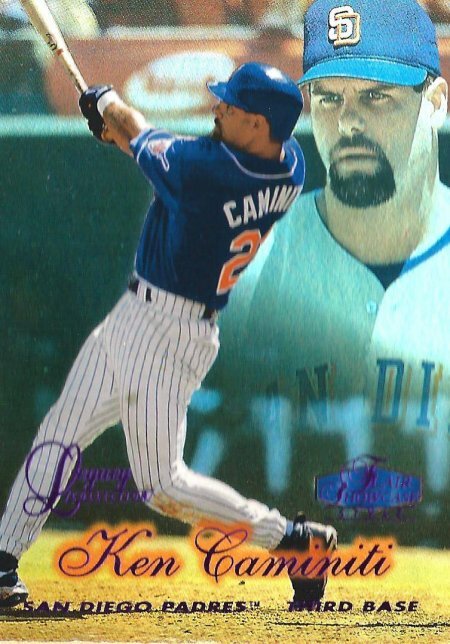 These are probably replacement cards that Fleer had hanging around..
Is there a list of available players? They were replacement cards. Maybe 20 of each exist. Teaching your kids the value of cards is an important lesson. Looking for any Fred Williamson cards #'d /10 or less. I've never seen one, at least for Butler. Does one guy have the market cornered on all of them? If so, who is he and how do I get in touch with him? A guy on BO has some from the Bankruptcy and is asking $300 for a pair of Loftons, no thanks. I too was offered one of these through blowout for Justice at $150. Couldn't find any definitive info on them, but have seen other responses where there may be a few of these replacements out there. On the bright side, at least someone didn't put the "1 of 1" on and try to pass them off as the real deal. Looking for 1999 SP Signature Edition autos as well!